We all know that there are hundreds of social media, bookmarking, and networking sites out there. Plurk is just the latest one to come along, and is, in the infamous words of the Talking Heads, “Burning down the house”. It’s a hot property out in web-world and it’s only a few months old. It works a lot like Twitter, but without the meltdowns and inspires a sense of the unknown. – Users have 15 verbs to predicate their messages with. For example, “loves”, “hates”, “thinks”, “wishes”, “was”, etc. This, I believe, allows users to formulate better, more coherent “Plurks”. 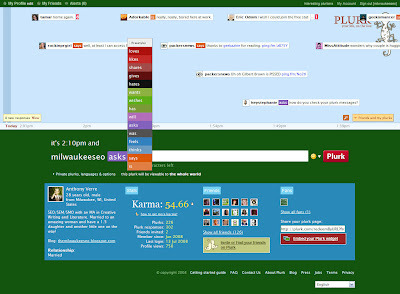 -Users can build up a following and receive friends’ plurks. All plurks are set on a timeline and displayed chronologically. This is an interesting feature which I found, to be honest, strange at first, but have grown accustomed to. I find that the plurks of others are more organized and not nearly as congested as they can get on Twitter. Plurking. The more you plurk, the more Karma points you can earn. My initial thought is this concept is a winner. The interface is easily accessible, clean, and well organized. And, I like that it doesn’t “have to” interface with hundred other social networking/media apps out there. Even though it’s in its infancy, the creators feel strong enough that it can stand on its own. This one definitely makes it into my Top 10 Social Media apps, not only because of its winning features, but also because it is fairly undiscovered territory at this point. This site should be up for SEOMoz’s Web 2.0 award next year. I don’t have a real “I Wish This Site Had” list yet. Right now, I think it functions perfectly. I want this site to grow organically before it feels like it has to add features and massive interconnectivity to the rest of the social networking world.